On Jan. 8, the AquaKnights girls and boys teams landed wins against Paideia and The Walker School in their first home meet of the new year. The teams racked up 32 personal-best performances, four new state-qualifying times, a new school record and two Iron Knight Awards. Becoming an Iron Knight is no easy feat. These outstanding swimmers achieve this milestone by swimming state championship-qualifying times in every individual event. Senior Charlie Kaye and junior Erin Hood both earned the award at the Jan. 8 meet; Kaye took first in the 500 freestyle and 200 IM, and Hood won the 100 butterfly and 100 breaststroke. Sophomore Lizzy Kaye finished first in diving with a new six-dive school record, followed by sophomore Maggie Jenkins in third and freshman Kate Grabowski in fourth. Junior Will Stratton won the boys diving competition, followed by seniors Tase Karamanolis and Cooper Selig in second and third, respectively. Other top finishes included the boys medley relay of Kaye, juniors John O'Brien and Jason Rosenbloum, and senior Carter Frooman, which took first. The girls medley—Hood, seniors Luisa Whitney and Sophia Lochan and sophomore Amalie Little—also finished on top. Junior Blake Maner won the 200 freestyle, while Frooman won the 100 freestyle, and the boys 400 freestyle relay of Kaye, Rosenbloum, Frooman and junior Dillon Carroll also finished on top. 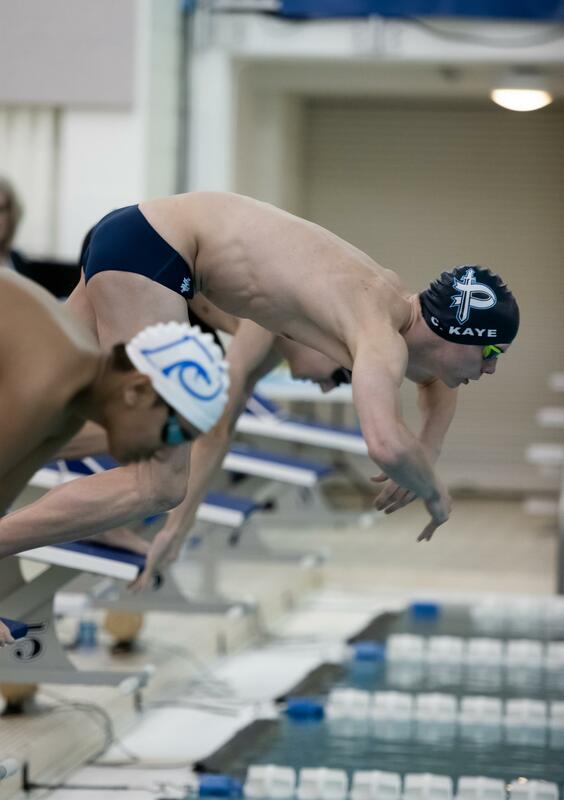 On Jan. 12, the AquaKnights competed at the Riverwood Invitational Meet, where 20 schools participated. The boys team finished in eighth place, and the girls finished in fifth. Four meet records and one school record were set; three state qualifying times were lowered; and there were 37 personal-best times. C. Kaye set three new meet records and lowered his state-qualifying times with his first-place finishes in both the 50 freestyle and 100 backstroke, and with his 100 freestyle lead-off swim in the 400 free relay. L. Kaye set a new meet record in diving, broke the Pace 11-dive record and earned her first set of perfect 10s from all judges. The boys 400 free relay (C. Kaye, Frooman, Rosenbloum and Carroll) finished seventh and achieved a state-qualifying time. Other highlights of the meet included: sixth place for the boys medley relay (C. Kaye, Frooman, O'Brien and Rosenbloum); seventh place in the 200 free and second place in the 100 free for junior Meghan McMillin; second place for Hood in the 200 IM and the 100 breaststroke; seventh place for L. Kaye in the 100 backstroke; second place for the girls 200 free relay (L. Kaye, Whitney, Hood and McMillin); and third place for the girls 400 free relay (Hood, McMillin, Whitney and Little). The AquaKnights will compete next at home against Woodward Academy on Thursday, Jan. 17. 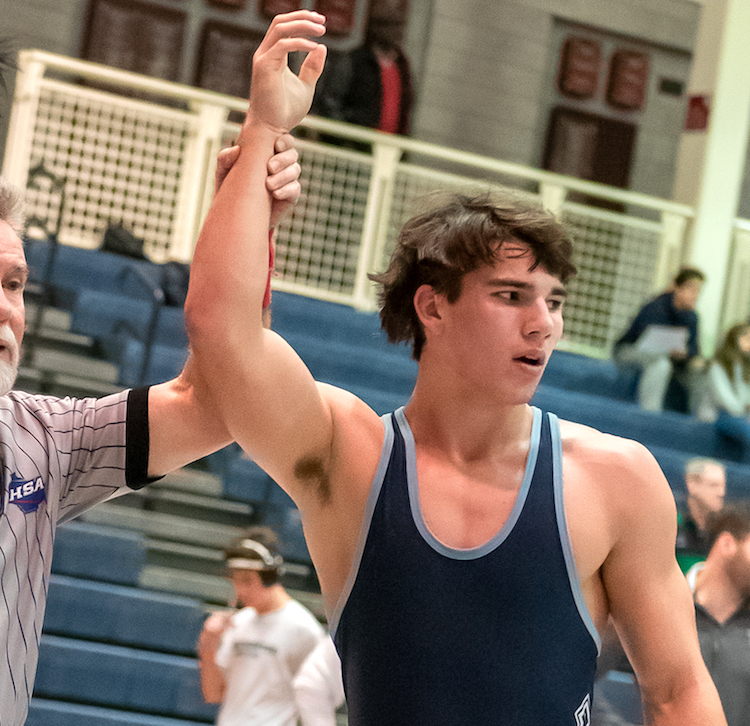 Over the break, the wrestling team battled at the Prep Slam at Holy Innocents', beat The Walker School at home and competed at the Area Duals. At the Prep Slam, senior Charlie Warren became the 11th wrestler in Pace Academy history to earn 100 career wins. In typical Charlie fashion, he earned No. 100 with a 27-second pin against his opponent from Cardinal Gibbons High School. Freshmen Sam Howe, Jude Black and Nile Bennett also won matches in the Southeast's most competitive private school tournament. On Jan. 8, the Knights hosted The Walker School and Decatur High School in two competitive matches. Pace beat Walker 66-9, but fell to Decatur 45-33. The freshmen really shined, many winning by pin. Warren and junior Connor Husk were each 2-0 on the night, and freshmen George Blaha, Edward Blaha, Ben Schiffer, Black, Henry Leusink, Bennett, Alex Mathias, Xavier Agostino and junior Grant LeRoux each finished with a victory. On Jan. 12, the team traveled to Fannin Country for the Area Duals. In the first round, Pace was matched against the tough No. 3 seed, Dawson County. The Knights wrestled well in the contest and held a 30-24 lead after 10 of the 14 matches. G. Blaha got a first-period pin for his 25th win of the season. Warren also earned a pin; E. Blaha had a 7-2 victory; Agostino won 3-2 in the final seconds; and Sam Howe took a forfeit. In the end, Pace lost 48-30 and did not advance in the tournament. The Knights compete again this Friday, Jan. 18, at home at 5 p.m. This will be Senior Night for Ahsan Hennings, Harrison Husk, Chilton Tolliver and Warren. It was a week of highs and lows for the varsity girls basketball team as the Knights suffered their first region loss of the season (37-33) to the Cedar Grove Saints on Tuesday, Jan. 8. Points were scarce as both teams played solid defense for all four quarters. Pace rallied in the final quarter to cut the lead to two points, but the Saints finished strong on their home court, making key foul shots that sealed the game. Seniors Kayla Ross and Joelle Zelony led the way offensively, finishing with 12 and 10 points, respectively. Junior Virginia Hobbs had a scrappy performance with eight rebounds and three steals. 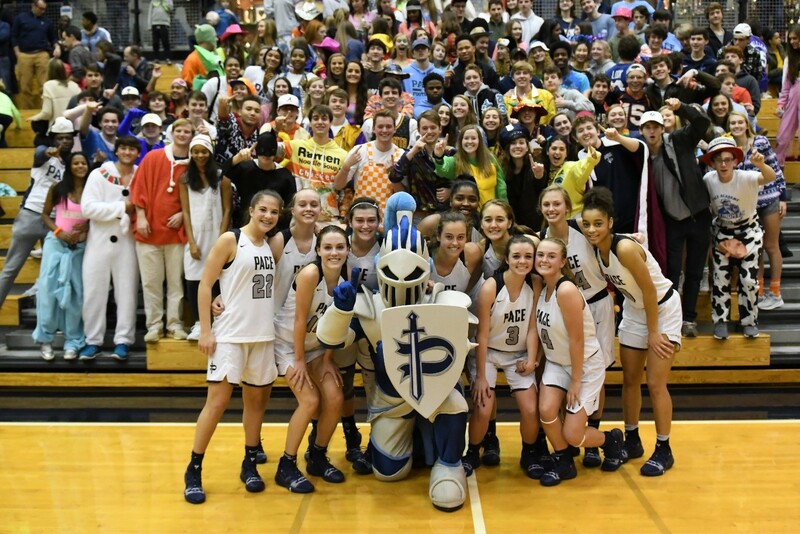 On Saturday, Jan. 12, the Knights bounced back with a 50-48 win over the Lovett Lions in front of a packed house at home. The Knights came out on fire, finishing the first quarter with a 17-8 lead. Hobbs and Ross were in early foul trouble, and sophomore Camryn Jones provided a huge lift during crucial moments in the game, hauling in seven rebounds and scoring six points. The Lions rallied late in the third quarter and into the fourth, but the senior leadership from Paige Fleming, Ann Rafeedie, Madeline Janki, Ross and Zelony was strong enough to win the day. Rafeedie and junior Jordan Upchurch made vital foul shots late in the fourth quarter to seal the win. The Knights managed to score 50 points without a single player scoring in double figures. With this victory, the Knights have moved into first place in the region. Please join us for faculty appreciation night tonight at 5:30 p.m. as the Knights take on the Stone Mountain Pirates, ranked No. 2 in the region. Over the winter holiday, the varsity boys basketball team faced off against Miramar High School (Florida) in the Annual War Eagle Classic, and unfortunately lost, 53-43. The Knights were led in scoring by sophomore Madison Durr, who poured in a season-high 23 points, shooting 9/16 from the field and grabbing seven rebounds. The Knights' second game of the tournament pinned them against Hewitt-Trussville (Alabama), and Pace won a close battle, 60-58. The Knights received a strong scoring and passing output from junior guard Reign Watkins, who contributed 15 points and dished out three assists. Durr had another strong scoring night, pouring in 20 points and scoring 10 of those points from the foul line. The Knights were strong from the foul line against Hewitt-Trussville, going 20/25 and finishing at 80 percent. On Tuesday, Jan. 8, the Knights began their 2019 campaign with a heartfelt win on the road against region champion Cedar Grove. They emerged victorious, 52-45. The Knights received a strong scoring output from Durr, who contributed 15 points and grabbed seven rebounds. Junior Ben Crawford also put in a solid performance; he scored 7 points and took the team's lone charge. 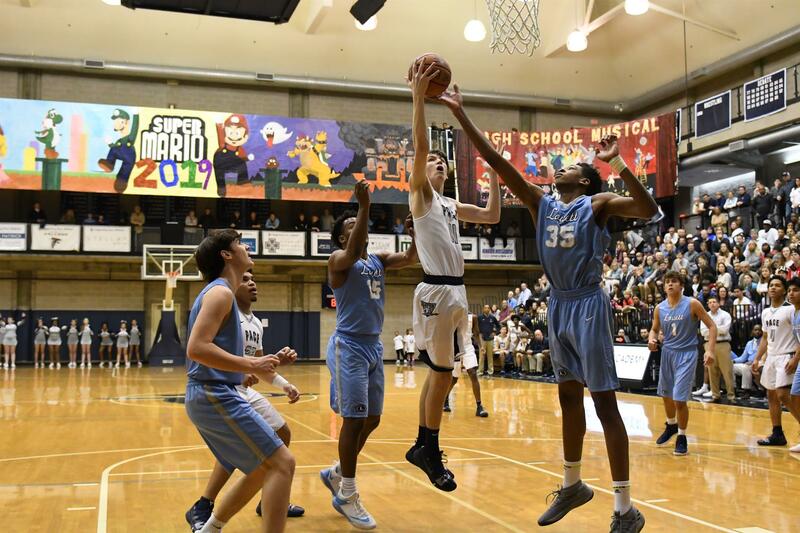 This past Saturday, the Knights squared off against the Lovett Lions and lost a heartbreaker, 54-43. Watkins and sophomore Justin Johnson led the team in scoring, each putting in 10 points. Johnson also grabbed seven rebounds and knocked down both of his three-point attempts. The Knights look to get back on track against Stone Mountain in the Inman Center tonight at 7 p.m.